NETWORK FINALS: CBS’s NFL PLAYOFFS game adjusted to 7.9. Elsewhere, the entire NBC line-up adjusted: the WILL & GRACE rerun down 0.3 to 1.5, the SUPERSTORE rerun down 0.3 to 0.8, DATELINE down 0.3 to 0.6, and the SNL rerun down 0.1 to 0.8. 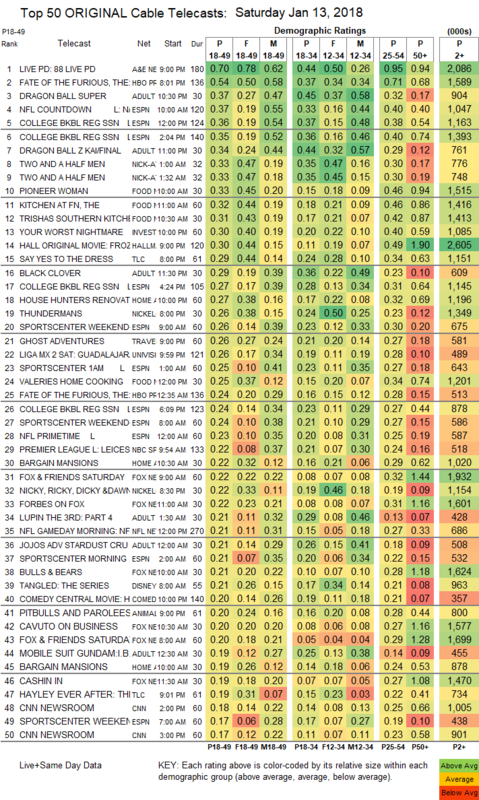 CABLE HIGHLIGHTS: A&E’s LIVE PD took Saturday cable, up 0.08 to 0.70. The Adult Swim line-up performed as follows: DRAGON BALL at 0.37/0.34 compared to last week’s 0.46/0.40, BLACK CLOVER down 0.02 to 0.29, JOJO’S BIZARRE ADVENTURES down 0.06 to 0.21, MOBILE SUIT GUNDAM down 0.04 to 0.19, HUNTER X HUNTER up 0.01 to 0.22/460K, LUPIN THE 3RD up 0.01 to 0.21, NARUTO up 0.03 to 0.21/430K, OUTLAW STAR up 0.03 to 0.20/421K, COWBOY BEBOP up 0.02 to 0.21/412K, and GHOST IN THE SHELL steady at 0.19/370K. ESPN’s COLLEGE BASKETBALL tripleheader was at 0.36/0.35/0.27. On Food Network, PIONEER WOMAN rose 0.03 to 0.33, KITCHEN AT FN ticked up to 0.32, TRISHA’S SOUTHERN KITCHEN was at 0.31, and VALERIE’S HOME COOKING ticked down to 0.25. ID’s YOUR WORST NIGHTMARE climbed 0.05 to 0.30. Hallmark’s movie FROZEN IN LOVE was at 0.30. TLC’s SAY YES TO THE DRESS ticked down to 0.29. HGTV’s HOUSE HUNTERS RENOVATION dropped 0.05 to 0.27. Nickelodeon’s THUNDERMANS was at 0.26. 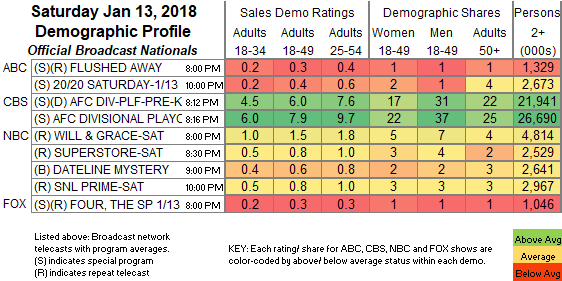 Travel Channel’s GHOST ADVENTURES lost 0.04 to 0.26. OWN’s WELCOME TO SWEETIE PIE’S gained 0.02 to 0.15. USA’s FALLING WATER ticked down to 0.08.